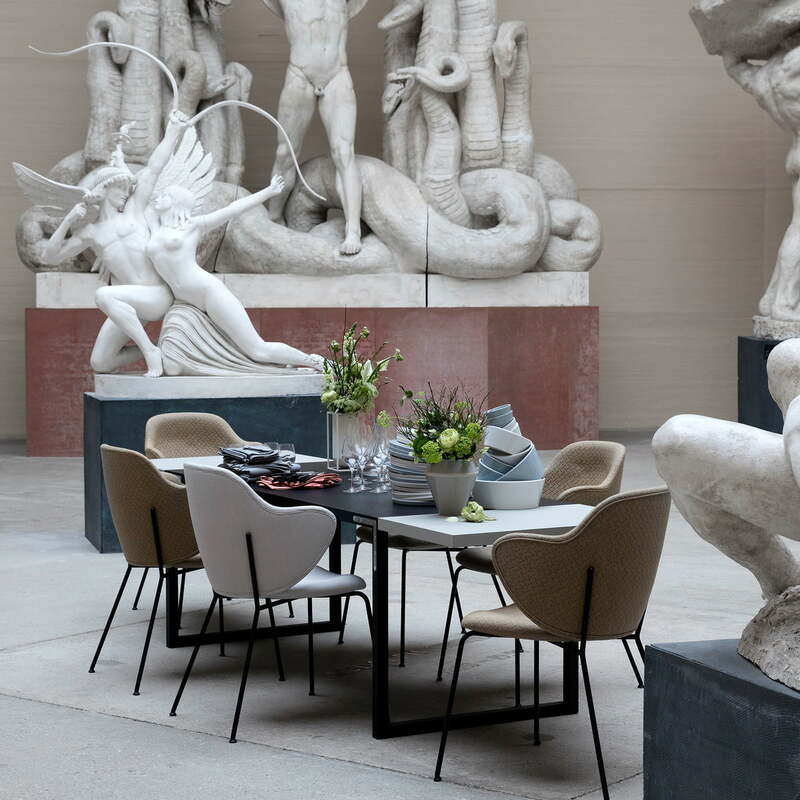 The Conekt dining table designed by the Danish design icon Mogens Lassen illustrates the architect’s love for minimalism. The table by the Scandinavian brand by Lassen is made of smoked oak and has noble metal details on the sides. Its straightforward, timeless design is convincing - whether in the dining room, living room or as a spacious alternative to traditional desks. The custom L-shaped brackets out of metal, that connect the legs to the table, have been thought out down to the smallest detail. They nestle perfectly against the wood and add a unique industrial flair to the minimalist table. Conekt's square, angular wooden frame legs are attached with precision to both ends of the table. This creates a sleek silhouette that has a light and timeless expression. A robust as well as elegant table, that offers space to eat, work and design. On request, the table is also available in other colours and versions. 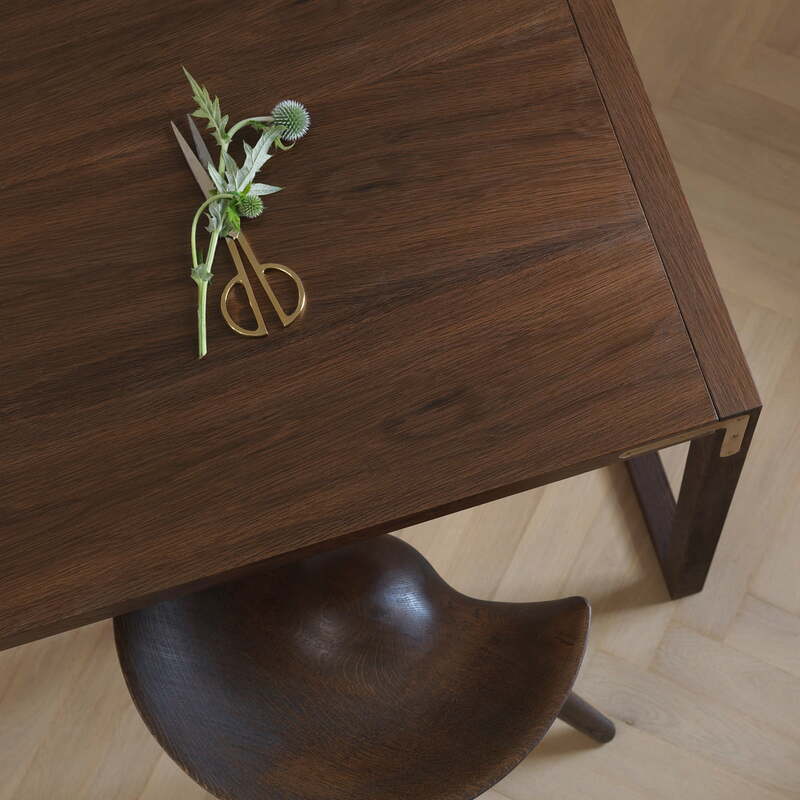 The Conekt dining table is as solid as it is decorative thanks to its production out of smoked oak and oak veneer. With the dimensions 190 x 80 cm, Conekt is a spacious living and dining room table. Thanks to its sleek, minimalist design, the Conekt dining table can be excellently combined with the wide range of chairs. Here with the ML42 stools, also manufacturer by ByLassen. 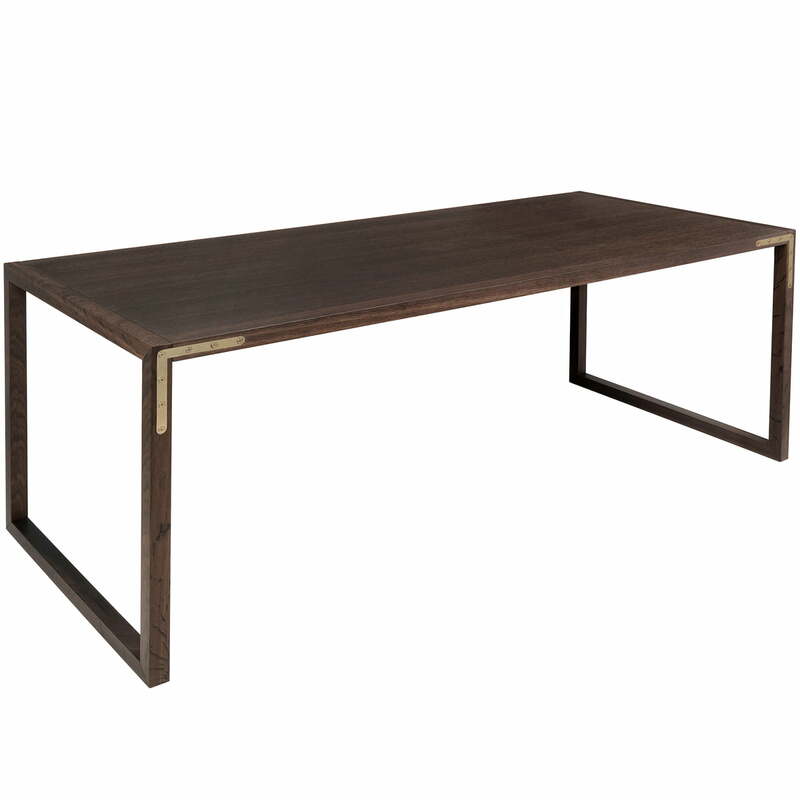 The noble brass L-shaped details nestle perfectly against the wood and offer striking details. The Conekt dining table introduces a hip, industrial flair. The Conekt dining table, pictured here with the ML42 stools, is a real eye-catcher. Whether in the dining room or living room, the minimalist table with exceptional brass details convinces in any environment. The Conekt dining table is the perfect place to bring together friends, to eat with the family, or to arrange a candlelight dinner. Up to three chairs can be placed on both sides of the table. Lifestyle product image of the Conekt dining table. 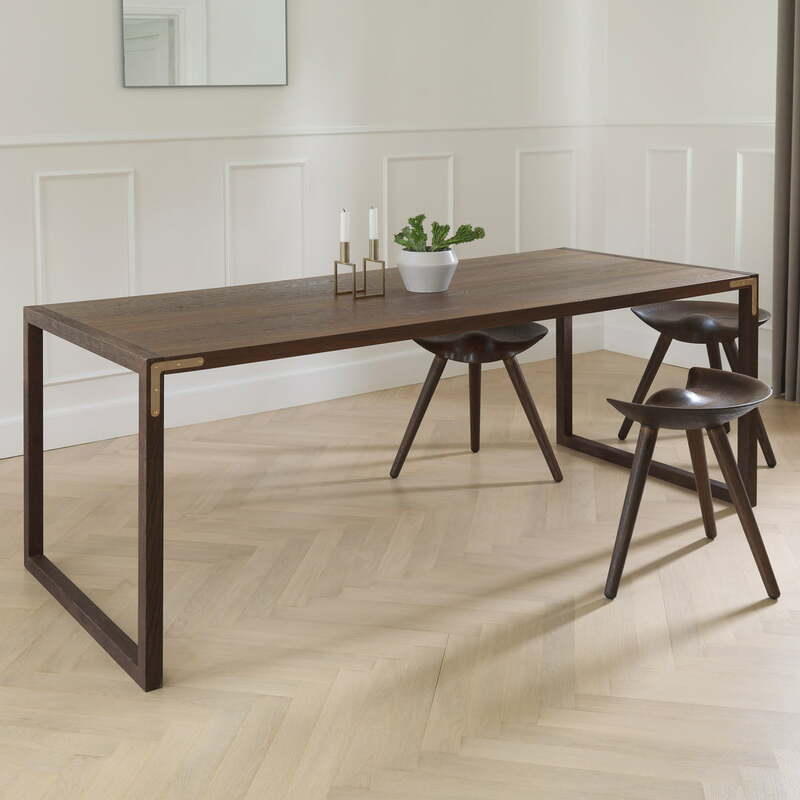 The square, square-edged wood frame legs of Conekt dining table give the table a sleek, seamless silhouette. A timeless minimalist design. Lifestyle product image: The Lassen Chair from by Lassen is a a stylish complement to the famous designs, the Tired Man chair, the Saxe foldable chair and the Conekt series.